One of the most renowned artists of the Bloomsbury Group, Vanessa Bell was an innovative painter and interior designer. Rejecting the Victorian style of narrative painting and notions of ideal femininity, Bell used her personal life in her paintings to explore modern life. 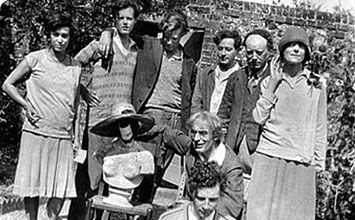 Known for his textile designs as much as for his paintings, Duncan Grant was a prominent member of the Bloomsbury Group. Grant's works were also notable for their European influences, primarily that of the French Post-Impressionists. Roger Fry was a nineteenth- and twentieth-century English artist and art critic. A scholar of the old masters, French Impressionism, and a champion of early-century British modern art, Fry's greatest contribution was the coining of the term "Post-Impressionism," which he attributed to developments in French painting following Manet, including Rousseau, Gauguin, Cézanne and others. Fry was also an accomplished art history professor and curator, at one point serving as Curator of Paintings for the Metropolitan Museum of Art. Wyndham Lewis was a twentieth-century English artist and author, founder of the English Rebel Art Centre, and the co-founder of the short-lived Vorticist art movement, which is commonly considered the English counterpart to the more well-known Italian Futurist movement, although neither movement claimed any association with the other. Politically, Lewis was a polarizing figure in literary circles, given his sympathy for Fascism and in particular Adolf Hitler, whom Lewis portrayed as a sympathetic victim of communist oppression in his book "Hitler."